Fluidized bed filters utilize an upwelling current of water that passes through a sand media causing the sand particles to constantly move in a flowing manner. 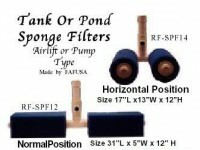 This filter maximizes and promotes active surface areas by the continuous motion. A cubic foot of common sand media provides 6,200 sq ft of surface area. Fluidized beds are not considered particle filters since they actually tend to break down particles into even smaller pieces which only adds to the BOD. 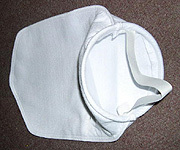 Although the filters are small in size they are rated high in biological activity, capable of handling up to 8+ grams of ammonia per pound of filter media per single pass. Compared to other contained filters these offer low back pressure, (< 4 psi) which allows use of economical low pressure pumps and powerheads. Compact quality moulded assembly. Unit holds more sand then conventional small units on the market. Can be hung on side of tank or floor mounted. Inlet ports provided on top or bottom depending how installed. Increase capacity by installing two or more units in series. As with all fluidized bed filters particle filters should be installed before fluidized bed filters and UV units. Has clear chamber for easy flow adjustment using control valve provided. Come with fine sand media which gives a flow rate of about 2 liters/minute. To increase flow but diminish bio activity larger sand particles can be added. Small submersible pump is needed.